That’s well correlated, but there is definitely dispersement, especially outside of the low and high places. 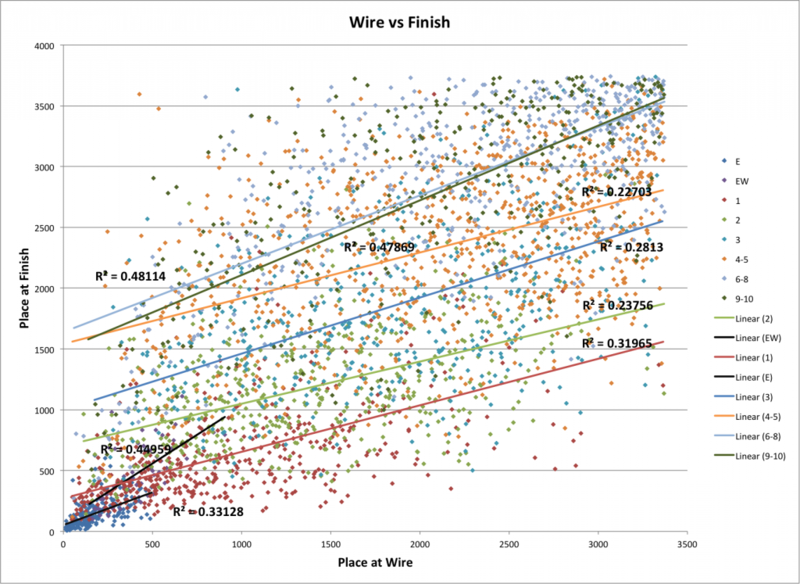 This is because there are fewer skiers and we’re correlating places, not times—so gaining five minutes in the elite wave only gains a handful of places, while gaining that time in the middle of the pack can gain hundreds of places. 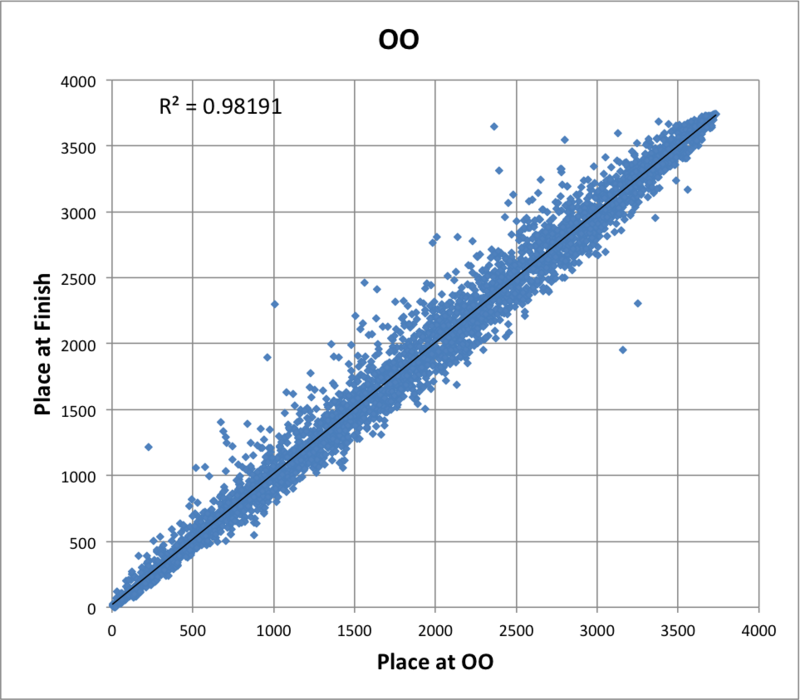 R-squared of 0.995. Yeah. 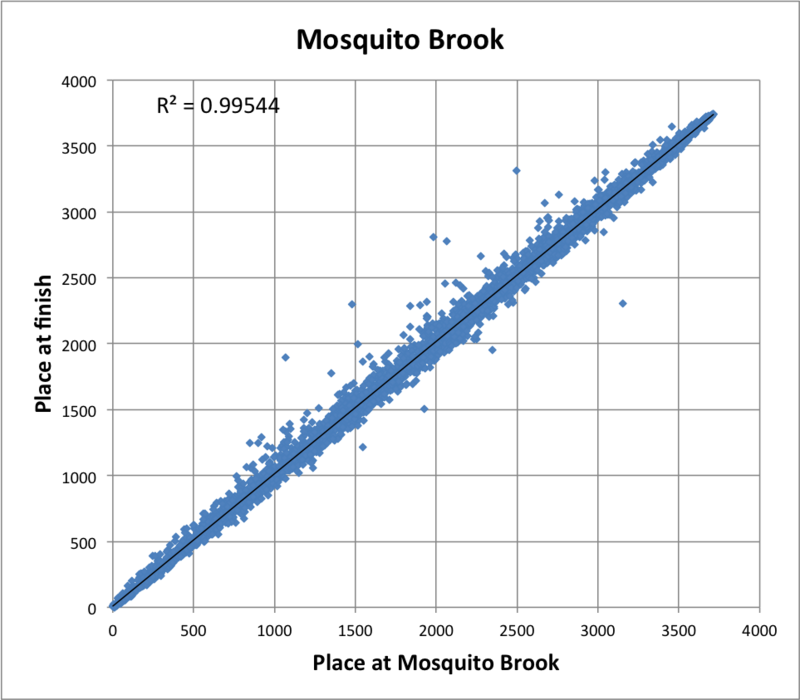 There are a few people who gain or lose a lot of places, but out of 3700 finishers there are fewer than a dozen. 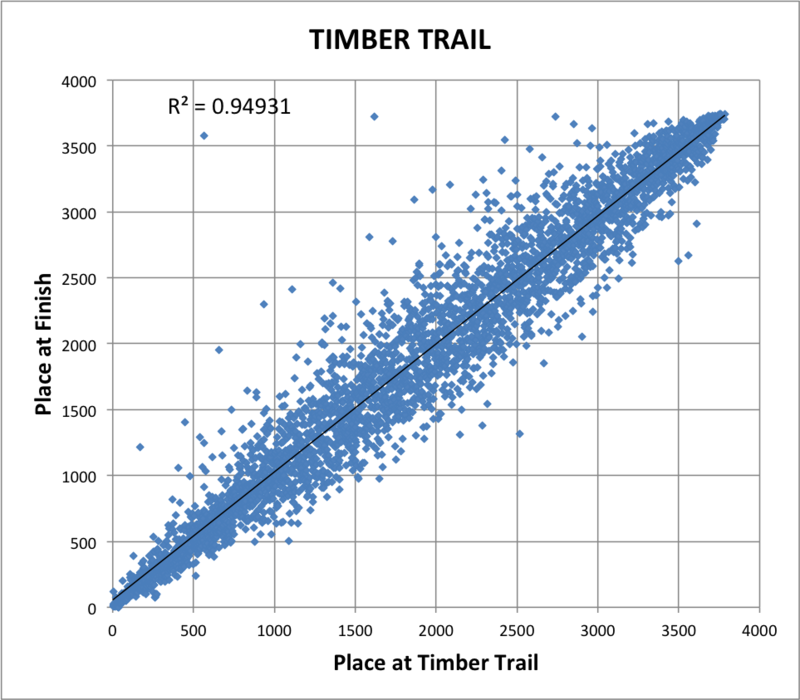 Wherever you are in the race at 38k, you’re very likely to finish within ±100 spots. There are a couple of things to note here. First, I dropped anyone who took more than 5 minutes to get to the wire—the rules allow you to start with a later wave than designated, and the correlations of people who started half an hour late but ski pretty fast mess up the overall picture (i.e. there’d be a bunch of noise above place 3400). So, five minutes it is. Second, remember that this is by place, not by time. 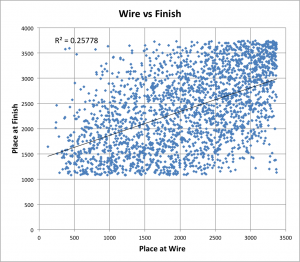 What this shows, amongst other things, is the density of finishers. At the start and end, there is a trickle of skiers down Main Street. In the middle, there’s a deluge. 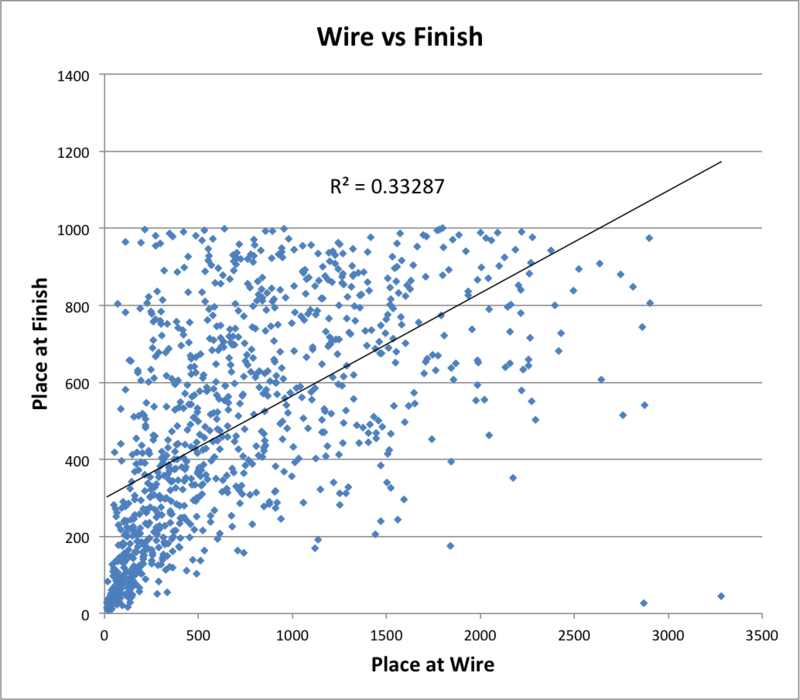 So if you get to the wire in 200th place and catch 20 skiers, you might put several minutes on them and finish 180th. 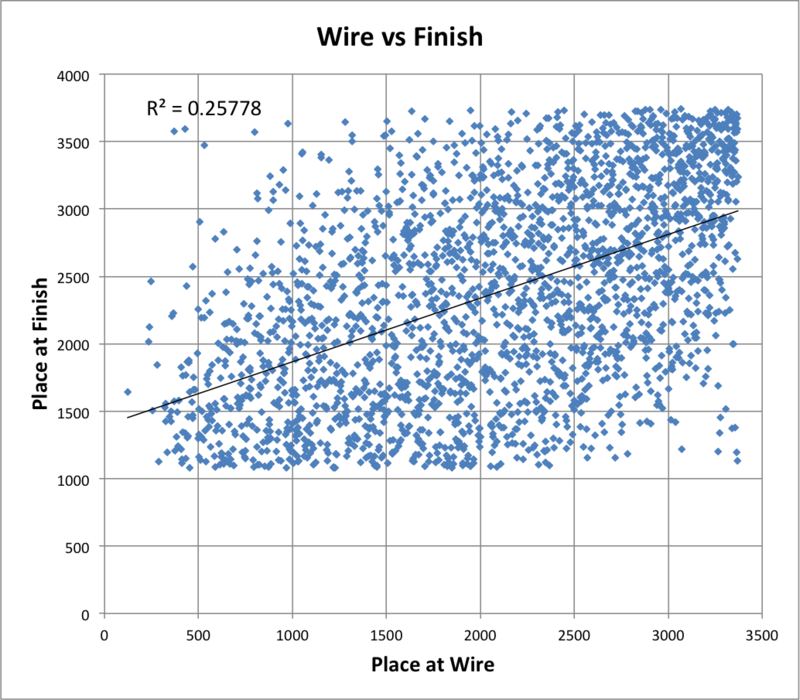 If you cross the wire in 2000th place and catch 20 skiers, you’ll only be a few seconds up on them. Finally, remember that correlation does not imply causation. 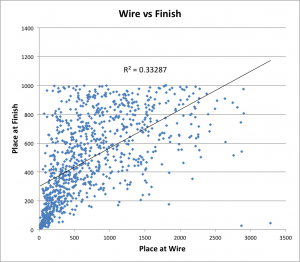 The top skiers didn’t finish high because they got to the wire faster than anyone else, they finished high because they’re damn fast skiers. And, if we want to get a little too excited, we can break the correlations out by waves, each with their own R-squared (combining a few waves for simplicity). Click to enlarge. 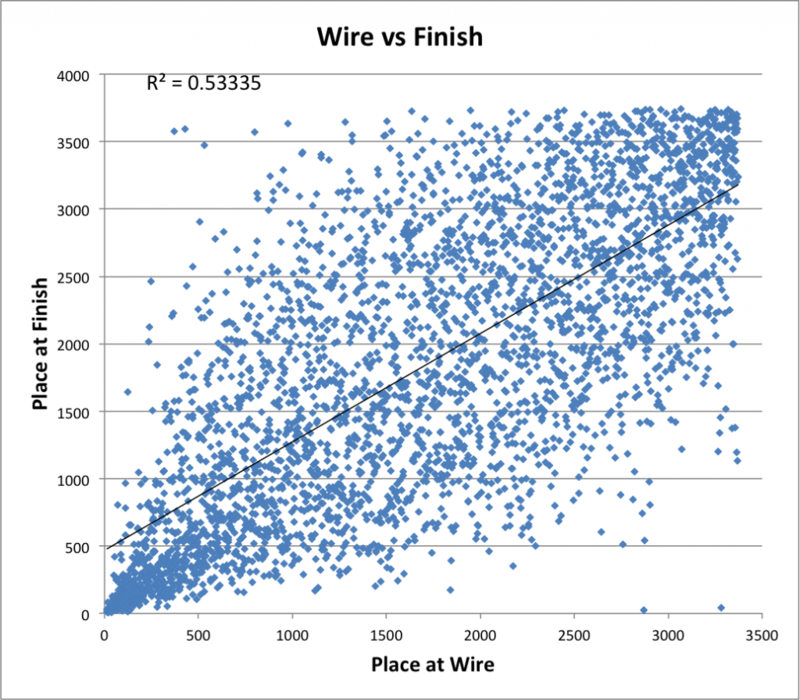 One notable item is the different slope for the elite women versus any other field; there’s far better correlation there. It’s also the smallest start group in the race, with only about 50 skiers. While the elite men line up four or five deep, the elite women start out in basically one or two wide lines. How long it takes to get to the line is, therefore, less a product of who you might get stuck behind in the start, but rather how fast you can ski the first 300 meters of the course. My overall takeaway is that the Elite Wave is correlation without causation: the good skiers seed in to the front wave and lead the whole way. There may be some causation in the first and second waves—the first especially—as skiers who get to the front and get out faster are less likely to get bogged down with hundreds of others. I’d assume that the R-squared for higher waves are based on self-seeding. No one from those waves are intent on making every second count, even if one guy did make it from Wave 5 all the way to the Elite.